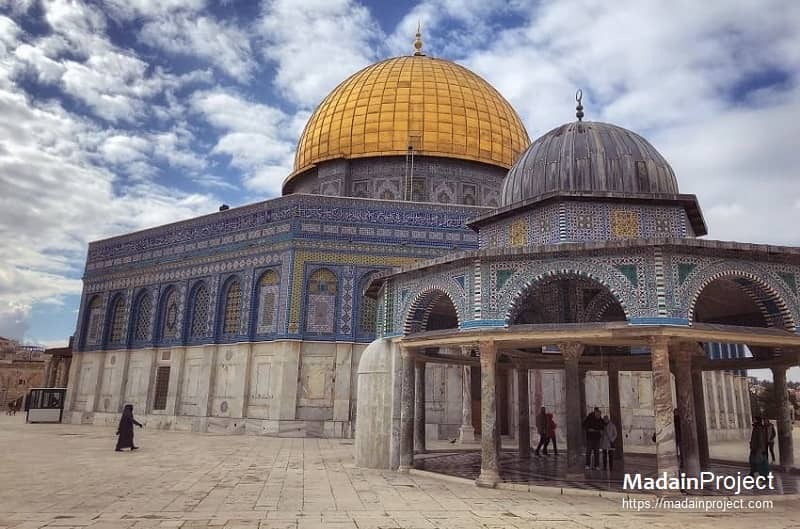 The dome of the Rock shrine, with the large golden dome and an octagon structure, was built by the Umayyad Khalif Abdul-Malik ibn Marwan in 691 (72 year according to Muslim calendar), and named it after Omar. It is one of the most beautiful and enduring shrines in the World, and remained almost untouched throughout the years. The rock is, according to Muslim tradition, the spot where prophet Muhammad (pbuh) ascended to heaven. Dome of Rock (Qubat ul-Sakhr'a) at Temple Mount (Haram al-Sharif). 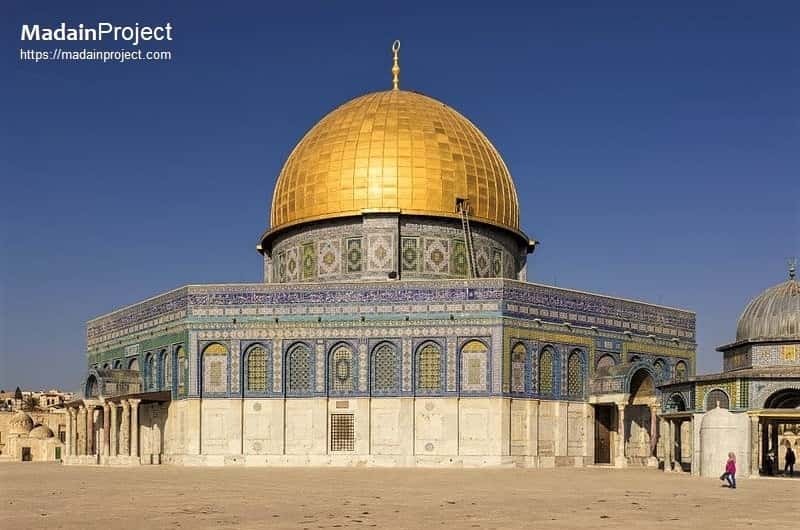 It was initially completed in 691 CE at the order of Umayyad Caliph Abd al-Malik during the Second Fitna on the site of the Second Jewish Temple, destroyed during the Roman Siege of Jerusalem in 70 CE. Its architecture and mosaics were patterned after nearby Byzantine churches and palaces, although its outside appearance has been significantly changed in the Ottoman period and again in the modern period. notably with the addition of the gold-plated roof, in 1959–61 and again in 1993. Dome of Rock as seen from Mount of Olives, Jerusalem. 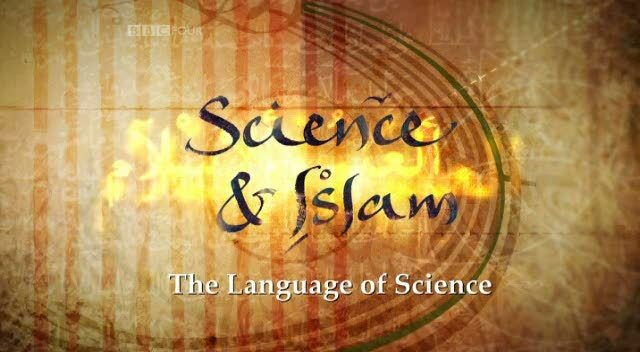 It was initially completed in 691 CE at the order of Umayyad Caliph Abd al-Malik during the Second Fitna on the site of the Second Jewish Temple, destroyed during the Roman Siege of Jerusalem in 70 CE. The eastern wall and Maqbara (cemetery) Bab al-Rahma can be seen in the lower area. The Dome of Rock with the western Qanatir (arched entrances). Arched gates, also called “scales,” comprise a number of stone or marble columns that are linked together using arches. A number of arched gates surround the Dome of the Rock’s plateau on al-Aqsa compound, each one of them connected to a staircase. In addition to facilitating worshipers’ accessibility to the 4-meter high plateau, the gates were built to serve a decorative function. 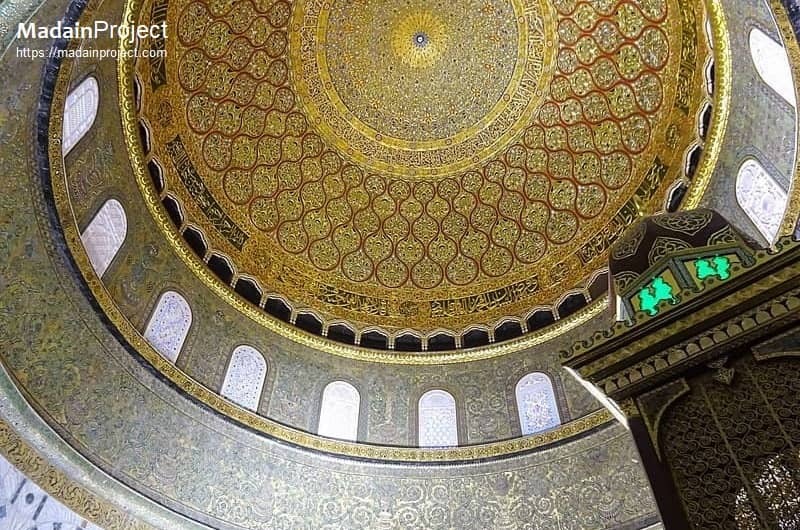 The Dome of the Rock (interior) is now mostly assumed to have been built by the order of Umayyad Caliph Abd al-Malik and his son and successor Al-Walid I. A dedicatory inscription in Kufic script is preserved inside the dome. The date is recorded as AH 72 (691/2 CE), the year historians believe the construction of the original Dome was completed. 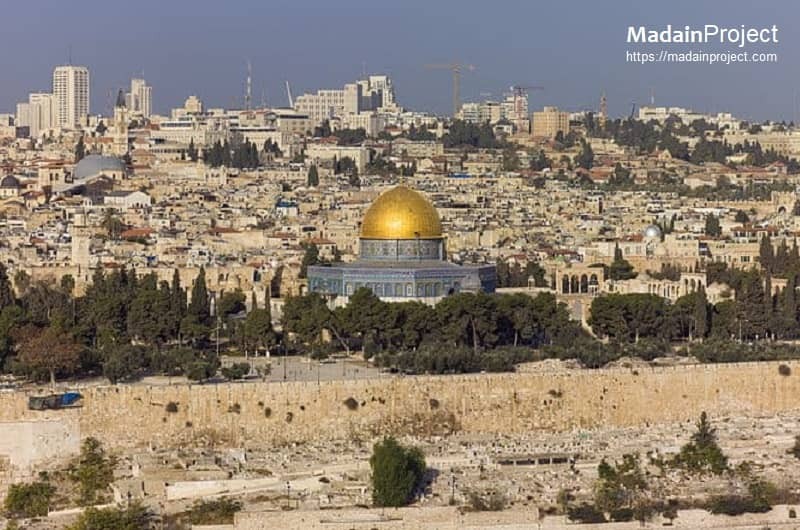 The Foundation Stone and its surroundings is the holiest site in Judaism, Christianity and Islam. According to Jewish tradition, the stone is the site where Abraham prepared to sacrifice his son Isaac. According to some Islamic scholars, the rock is the spot from which the Islamic prophet Muhammad ascended to Heaven accompanied by the angel Gabriel. 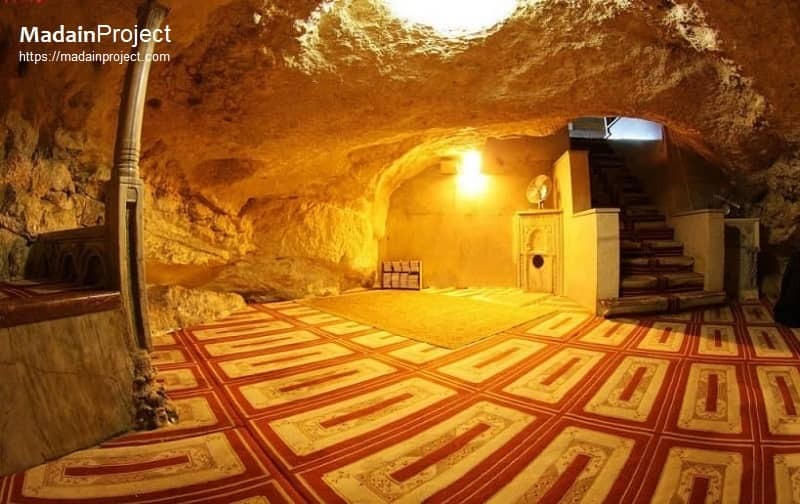 Further, Muhammad was taken here by Gabriel to pray with Abraham, Moses, and Jesus. The exterior of Dome of the Rock, with Dome of the Chain as seen from the east. 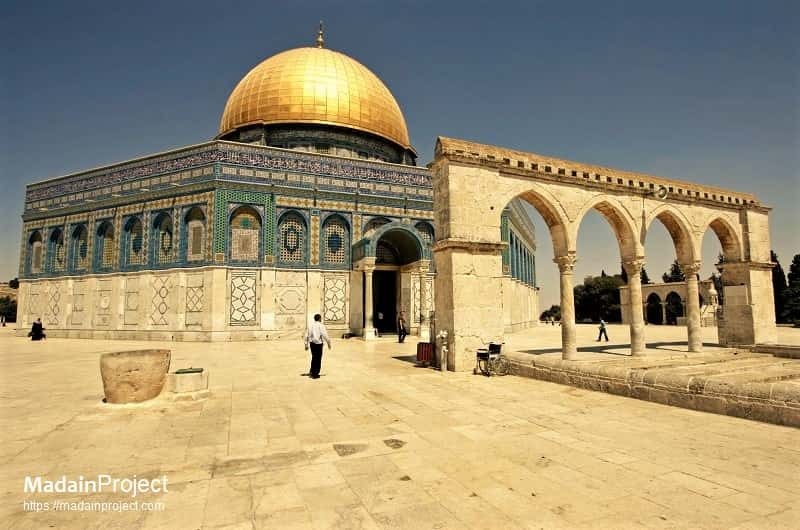 The Dome of the Rock has inspired the architecture of a number of buildings. These include the octagonal Church of St. Giacomo in Italy, the Mausoleum of Sultan Suleiman the Magnificent in Istanbul, the octagonal Moorish Revival style Rumbach Street Synagogue in Budapest, and the New Synagogue in Berlin, Germany. 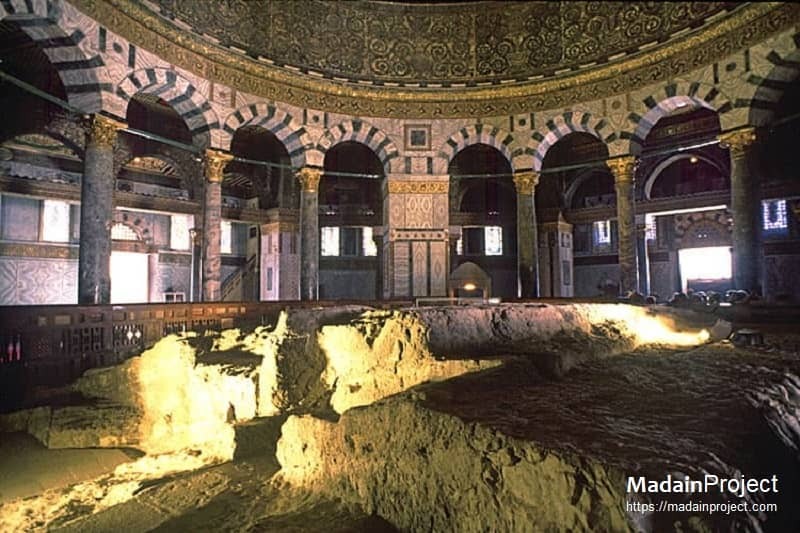 Panoramic view of the Well of Souls, a partly natural, partly man-made cave located inside the Foundation Stone under the Dome of the Rock shrine in Jerusalem. The name "Well of Souls" derives from a medieval Islamic legend that at this place the spirits of the dead can be heard awaiting Judgment Day. For Christians, the site is known as the Holy of Holies (alluding to the former inner sanctuary within the Temple in Jerusalem).